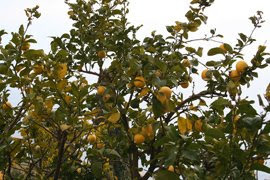 Specks of yellow in the trees on the opposite side of the corniche – could these be lemon trees? When I’m ready to go out, the clouds finally containing their tears, it is midday. I start my one-hour journey by walking down towards the town centre of Beausoleil and Monaco. I follow the first hair-pin bend and arrive at the specks of yellow: they are indeed lemons. 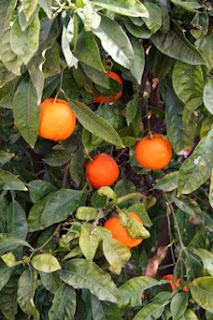 But right next to them are also mandarin trees, orange spheres dotting dark-green and brown leafy branches. 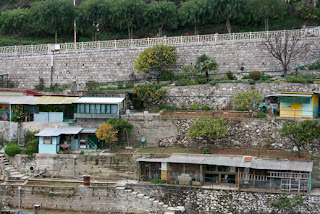 Fruit trees on tiny terraces, lodged between the road above and the paths below, no houses, just rocky and pebbly balconies, with the force of life growing on them. Such a surprising sight! The morning traffic has finally died down. The view I behold when I round the next corner is breathtaking. The sky is lighter in places, so I can finally distinguish the sea. The line of the horizon is black, then the white clouds take over and lead to further, dark-grey dense cotton balls. The sea is peppered with white boats. Above, the cliffs and hills of the coast, with tall apartment buildings, not very pretty but typical of the area, in tones of yellow, ochre and light pink. When I get to the escalier de la noix (walnut stairwell), my calf-tightening and knee-breaking journey begins. I go down the stairs carefully, as the surface might be slippery. It has been raining hard and each step is sloping down a little – a treacherous combination. When I reach a crossroads of sorts, I choose the wrong path and end up trespassing on to someone’s grassy alleyway and more terraces of lemon and mandarin trees. I retreat and get back on to the tarmac. My shoes and trouser hems are soaking wet, the chill from the ground going straight up the front of my legs, travelling to my arms, sending a shiver down my spine right back down to my heels. Brrrrr. Shouldn’t have made that mistake. From the Casino stop, I take the bus to Fontvieille, the financial and commercial district of Monaco, where B and R work. Monte Carlo is the richest part of Monaco, with the Casino and the grandest hotels and houses, and sprinkled with lavish boutiques such as Dior, Vuitton and Dolce & Gabbana. Larvotto is the area with all the beaches and further buildings hiding sumptuous flats and expensive shops. La Condamine is the northwest section of Monaco, which includes the expensive-yacht-filled port. Finally, Monaco-Ville is the part that boasts the palace. It is the old city, placed on a rocky promontory extending into the Mediterranean, known as Le Rocher (the Rock of Monaco). B and I meet up in front of her office and go for lunch at La Salière, a very Italian restaurant at the port of Fontvieille, with staff who speak at least French, Italian and English, some German too, and that serves a selection of four or five main dishes which changes every day. It makes choosing my lunch very easy (I tend to agonise for hours over several types of dishes – I don’t have that luxury today). I go for the asparagus and blue cheese risotto, B for the grilled seabass with tomatoes and potatoes. Within minutes, our dishes arrive. That is the other advantage of serving only a few dishes at each meal – they are nearly instantly ready, the busy businessmen don’t have to wait and you can endlessly say ‘hello’ and ‘goodbye’ to satisfied customers (there is enough time between 12 p.m. and 3 p.m. for probably four or five seatings!). It makes complete commercial sense, bravi! After ambling around the small shopping centre a two-minute walk away, I’m at a loss. Not a nice little café in sight! It’s raining again, it’s a bit cold, and my only options are a smoky café in the shopping centre (there is no smoking ban in Monaco, as yet) or a café outside in the cold. I’m a bit disappointed. I start walking away from the shopping centre, hoping that there will be more choice near the port of Fontvieille. I walk towards the port of Cap d’Ail, through empty streets and unable to dodge the raindrops, and finally spot a café: the Brasserie Le Cap, part of the Marriott Hotel. This will have to do. And it’d better be open. I pass by the swimming pool – desolate, grey – then the empty terraces, the tables covered in rain puddles, sad, longing for sunshine and people sitting behind them, and I finally reach the entrance door. It’s open! I sit down and order a green tea. It turns out to be very strong and a lot less enjoyable than I have anticipated. Nonetheless, finally sitting down, resting, in the quiet (only three tables are occupied! ), reading and writing my travel diary, the green leaves perk me up and the tiredness manages to leave me alone for a while. At 5 o’clock, I leave the café and go to the 10th floor of B’s building for a quick tour around her office. From now on, I will always be able to picture her at her desk, where R sits, where her boss’s room is and where her other colleagues are in the room compared to where she is. I am starting to know a bit more about my friend’s life and it feels nice and cosy. We drive back home in yet more rain – the Monegasques panic at the first drop, and the traffic is at a standstill near enough immediately – and sit down to a long-awaited cup of tea. Toes to toes, we are facing each other on the sofa and finally catch up. The last time we were able to talk for uninterrupted hours was in August 2002, before B jetted off around the world on a cruiseship, with R in the top offices of the kitchens, a welcome kind of déjà vu (this is how and where they had met 5 years before). Now we’re making up for lost time and it feels wonderful.